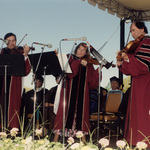 Ansell, Steven and Keyes, Bayla, "Muir String Quartet, Undergraduate Commencement Performance, 1994" (1994). Multimedia Works. 112.